In response to complaints about the lack of student involvement, Student Government Board selected nine students to represent the student opinion on the Plan for Pitt. Student Government Board Assembly, the lower body of the Student Government Board, announced the nomination of nine student representatives Tuesday to serve on the plan’s strategic working groups, which previously only included faculty and staff. The student representatives will provide input and answer students’ questions about the groups’ progress. There is a working group for each of the five goals of the plan, and SGB selected at least one student representative for each group — Mary Turocy and Lia Petrose for advancing educational excellence, Apoorva Kandakatla for engaging in research of impact, Chris Talbot, Harinee Suthakar and Miriam Yeana Kwagh for strengthening communities Max Kneis for building foundational strength and Marcus Robinson and Shutian Shen for embracing diversity and inclusion. The Assembly selected these representatives from 24 applicants through a group discussion at its meeting on Nov. 16. Harun said the Assembly looked at the students’ campus involvement in the areas related to the applicant’s preferred team. “We wanted to make sure these students had a well rounded Pitt experience that would allow them to be aware of what’s happening on campus,” Harun said. After the administration heard complaints about the lack of student involvement at the three open forums the University hosted to discuss the plan with Pitt students, Kenyon Bonner, interim vice provost and dean of students, worked with Harun to incorporate students in the implementation process of the plan. Harun announced at the Nov. 10, SGB meeting that students could apply to join a working group. Turocy said the student forums, and the issues students brought up there, motivated her to apply for the student representative position. After hearing students’ perspectives, Turocy thought she would be a good representative because she offered an unaffiliated opinion. As president of Students as Healers, an organization that works to eliminate the gap between medical service providers and patients, and a member of Habitat for Humanity, Turocy has experience leading a team and facilitating discussion. Raghav Sharma, Students for Justice in Palestine president, has been a prominent student voice throughout the engagement process of the plan but chose not to run for a student representative position because of his passion for issues on campus. “I don’t believe it’s appropriate for me to label myself as the entire student body if I’m approaching the issue with my own concerns,” Sharma said. Although Sharma, a junior politics and philosophy major, said the position is an important role, he does not think it will lead to the desired changes. “The perfect scenario that we are looking for is a broad-based, student-led movement that is less focused on the administration’s goals as they currently stand and more focused on forcing the administration to change their goals,” Sharma said. According to Harun, the students will serve on the forum for the remainder of the 2015-2016 academic year. Harun said she gave the names of the selected students to University administration, who will connect the students with the working groups. According to Student Affairs spokesperson Shawn Ahearn, Bonner had not yet ironed out the details of the process since it was still so new. Neither Bonner nor Harun knew when the representatives will begin meeting with their working groups. Bonner said in an email that he hoped the student representatives would offer “unique perspectives” to the working groups. 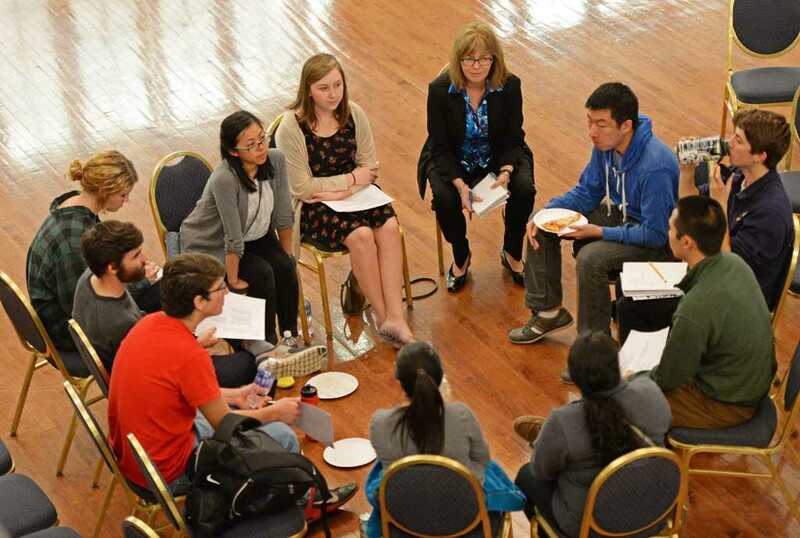 “The students who were selected by Student Government Board for these positions have a passion for helping Pitt to continue to improve, and we are confident they will enhance the discussions and make significant strategic contributions,” Bonner said. According to Talbot, the students will meet with their assigned working group once a month, but he anticipates the work will extend beyond the monthly meetings to include attending other events, communicating between meetings and reaching out to other organizations. Talbot’s working group — which focuses on strengthening communities — is broken into three groups to focus on different aspects of the community. Talbot is working toward strengthening Pitt’s community, Suthakar is working toward strengthening the regional community and Kwagh is working toward strengthening the global community. Talbot, a junior philosophy and psychology major, said his involvement with several different organizations on campus, including Beta Theta Phi and Jumpstart, as well as his experience with many courses outside of his majors have exposed him to the many opinions of Pitt’s communities. As an international student, Shen, a sophomore psychology major, wants to focus her efforts on including the international population. Through her experiences and hearing about her friends’ experience, Shen said she wants to improve communication between international students and resident assistants, as well as between international students and professors.